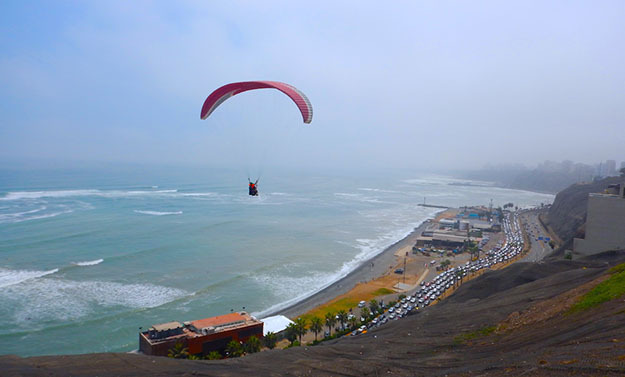 LIMA – A two-passenger paraglider eases up the Pacific coast between the Barranca and Miraflores districts of Lima. Barranca and Miraflores are two of the Peruvian capital’s 43 districts and are among the most likely for tourists to visit. Beneath the paraglider is a set of oceanside bars and restaurants where you can enjoy ceviche and pisco sours while watching surfers glide through the waves. Lima is a cruise port, which is one reason visitors come to this city of 10 million residents (roughly one-third of Peru’s total population). Another reason to visit is to spend time before or after excursions to Machu Picchu in the towering Andes Mountains or to the interior of the country for cruises on the Amazon River such as the ones organized by International Expeditions, an experiential travel company in Birmingham, Ala. A paraglider ride would be an optional outing on an International Expeditions visit to Lima.